"The Weight of Blood is simply outstanding. I haven’t experienced such a strong sense of atmosphere in a book in years....The plot centers around the disappearance of two young women in the fictional town of Henbane, Missouri....What makes this psychological suspense novel stand apart is McHugh’s vivid and luminous writing. Her ability to evoke a local vernacular and cloak the scenes with the lush Ozark setting creates a world all its own. She deftly layers a ruthless evil beneath the niceties of a small and isolated community, and the result is a page-turner that will haunt you long after you finish reading." For fans of Gillian Flynn, Scott Smith, and Daniel Woodrell comes a gripping, suspenseful novel about two mysterious disappearances a generation apart. INTERNATIONAL THRILLER WRITERS AWARD WINNER AND BARRY AWARD NOMINEE FOR BEST FIRST NOVEL NAMED ONE OF THE BEST BOOKS OF THE YEAR BY "BOOKPAGE"
The town of Henbane sits deep in the Ozark Mountains. Folks there still whisper about Lucy Dane's mother, a bewitching stranger who appeared long enough to marry Carl Dane and then vanished when Lucy was just a child. Now on the brink of adulthood, Lucy experiences another loss when her friend Cheri disappears and is then found murdered, her body placed on display for all to see. Lucy's family has deep roots in the Ozarks, part of a community that is fiercely protective of its own. Yet despite her close ties to the land, and despite her family's influence, Lucy darkly beautiful as her mother was is always thought of by those around her as her mother's daughter. When Cheri disappears, Lucy is haunted by the two lost girls the mother she never knew and the friend she couldn t save and sets out with the help of a local boy, Daniel, to uncover the mystery behind Cheri's death. "The Weight of Blood" is an urgent look at the dark side of a bucolic landscape beyond the arm of the law, where a person can easily disappear without a trace. 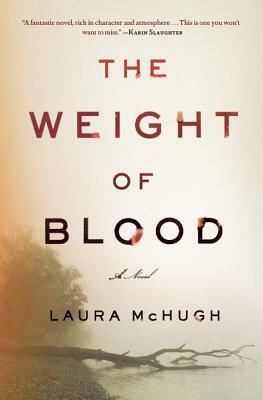 Laura McHugh proves herself a masterly storyteller who has created a harsh and tangled terrain as alive and unforgettable as the characters who inhabit it. Her mesmerizing debut is a compelling exploration of the meaning of family: the sacrifices we make, the secrets we keep, and the lengths to which we will go to protect the ones we love. Praise for "The Weight of Blood"
Haunting . . . a] riveting debut. "Los Angeles Times"
Laura McHugh's atmospheric debut . . . conjures a menacingly beautiful Ozark setting and a nest of poisonous family secrets reminiscent of Daniel Woodrell's "Winter's Bone." " Vogue"
Fantastic . . . a mile-a-minute thriller. "The Dallas Morning News"
The sinister tone builds relentlessly. " The Plain Dealer"
Daniel Woodrell better watch his back. . . . "Weight of Blood" is a tense, taut novel and a truly remarkable debut. . . . A suspenseful thrill ride that satisfies in all the right ways. "BookPage. Laura McHugh lives in Columbia, Missouri, with her husband and children. "The Weight of Blood" is her first novel.